The evidence is overwhelming: Sports help girls grow into strong women. Both scientific studies and anecdotal evidence confirm that athletic girls not only grow up to be healthier, but they also learn teamwork, gain inner confidence, and grow into society's leaders. Sports help preteen and teenage girls make the right choices in a society that is sending them incredibly mixed messages about who they are supposed to be. Yet no one is speaking directly to these girls. Jennie fills the role of girlfriend, big sister, team captain, and mentor. 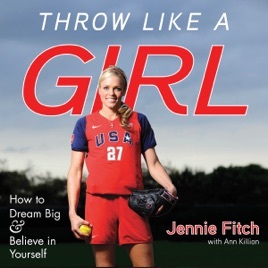 A smart, credible, and accomplished voice from an athlete who is strong and feminine, fiercely competitive, and fashionably cool, Jennie is someone young women will listen to and take to heart. Jennie's message: Believe in yourself. Go for it, girls. This audiobook offers engaging, family-friendly inspiration, perfect to listen together in the car or give as a gift to a young person.